Prime Minister Modi is only the second Indian premier to not go for the Non-Aligned Movement conference after Charan Singh in 1979. Downplaying Prime Minister Narendra Modi skipping the Non-Aligned Movement Summit, Vice President Hamid Ansari has said that there is no shift in India's foreign policy and asserted that it is participation that matters as it is "not a conference of Prime Ministers". Ansari is leading the Indian delegation for the NAM Summit in Venezuela's Margarita island in the absence of Prime Minister Modi, who is only the second Indian Premier to not go for the conference after Charan Singh in 1979. Asked what kind of message was India sending with Prime Minister Modi skipping the 17th NAM Summit, Ansari said, "India is participating. NAM is not a conference of prime ministers. 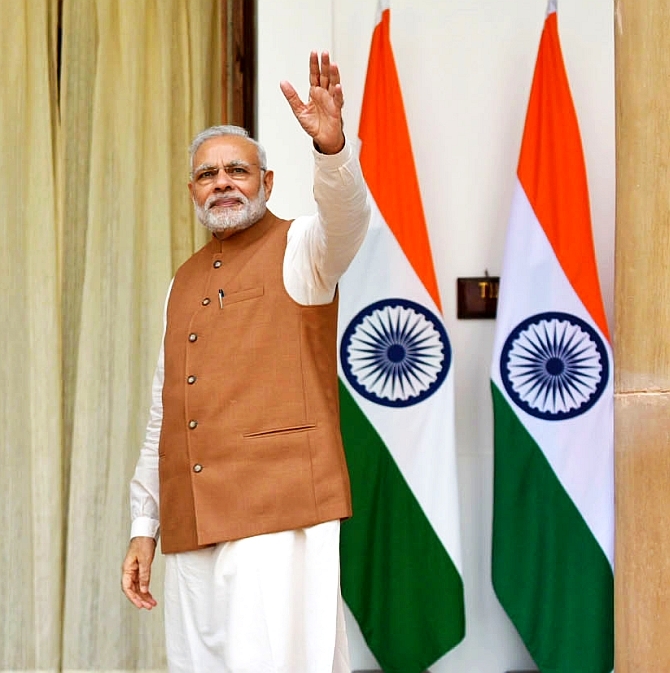 "Prime Ministers have been going but there have been occasions when for a variety of reasons they have not been able to go but India's participation remains," he said. He also asserted that India will strongly take up its concerns about terrorism at the summit as it has been doing at all international forums. "Yes we are doing it (raising concerns over terrorism) on all fora and certainly it (NAM) is an important forum and we will take it up, no question about it," Ansari told reporters on his way to attend the NAM summit. "Terror is something which impedes everything. If our objective is development, then terror cuts right across it. We need peace, we need social peace, we need international peace... both these are being interrupted by terror. Whatever the form terror takes, it is terror, it is terrorising civilian populations and therefore if the population is terrorised then it cannot devote itself to its normal pursuits, foremost amongst them is development. So it very much has to be taken up," he asserted. Asked if there has been a shift in India's foreign policy with the strengthening of the Indo-US partnership and if NAM has become less important, Ansari said there has been no such shift. "There was a methodology in 1961. The methodology underwent changes in the 70s, 80s, and 90. Again the methodologies are being adjusted but the objectives have not changed...I don't think we have shifted (in our foreign policy) and I don't think it should be seen as black or white, it is always shades of grey," he said. The Vice President, however, emphasised that the NAM has been evolving and must continue to evolve to stay relevant to the times. "It (NAM) has continuously evolved since its inception in 1961 and therefore it must evolve. Any organisation if it does not respond to the requirements of the day loses its relevance. So whatever our priorities of the day are that is to be determined collectively by consensus. Those priorities have to be addressed there is no way out of it," he said. Ansari stated that the group of countries that now number 120 came together because there were common concerns and common interests. "Over the years NAM’s agenda has partly remained the same, partly it has evolved with the requirements of times. But a few things remain constant...every country has the same priority in its agenda which is development and development not according to somebody else's perception or diktat but on its own perceptions," Ansari said, adding that the basic objectives remain the same. Noting that the chairmanship has now moved to Venezuela, he said the priorities of this conference are peace, sovereignty and solidarity for development. "Basic point is how do you devote your energies to development unless there is peace. If peace does not prevail then attention gets diverted. So we need peace, we need solidarity with the group of countries with a more or less converging objectives and development remains our priority. That is the purpose for which this gathering is taking place," he stressed. Asked what was India's stand on the economic and political turmoil in NAM's host country of Venezuela, Ansari said India does not have a point of view on what is happening in Venezuela or any other country within their domestic realm. "It is always been an article of faith with us that we do not interfere in the affairs of other countries. But as long as the policy of the state of Venezuela is subscribing to the basic objectives of NAM we are with them and they are with us," he said. India is one of the founding members of the Non-Aligned Movement and it had hosted the 7th NAM Summit in 1983 in New Delhi. The last NAM Summit was hosted by Iran in 2012. The membership of NAM comprises 53 countries from Africa, 39 from Asia, 26 from Latin America and the Caribbean and 2 from Europe (Belarus, Azerbaijan). There are 17 countries and 10 international organisations that are Observers at NAM. The Non-Aligned Movement came into being 55 years ago when leaders of 25 developing countries met at the 1961 Belgrade Conference. The summit comes amid political and economic turmoil in the oil-rich country which has skidded into crisis as lobal crude prices have plunged since mid-2014, pushing President Nicolas Maduro's socialist model to the brink.